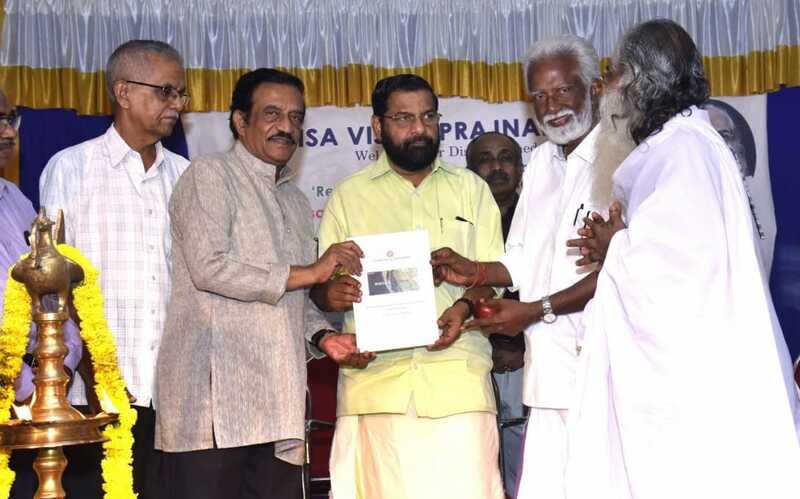 The Kerala State Minister for Tourism, Mr. Kadakampally Surendran, said that the State Government will seriously consider the Global Energy Parliament’s Sustainable State Model, which is designed to bring about greater long-term, holistic and sustainable development of infrastructure and use of natural resources by applying His Holiness Jagadguru Swami Isa’s I-Theory. The Minister inaugurated the Global Energy Parliament’s ‘Remoulding Kerala Sustainable State Model’ project in Thiruvananthapuram on March 29th. "I appreciate the sincere efforts of GEP to salvage Kerala from the aftermath of the floods and provide a long term sustainable solution for its maladies," said the Minister in his inaugural address. "The international consortium formed by GEP meticulously evaluated the last 100 years' development in Kerala State and have formulated a Sustainable State Model. It is imperative that Kerala makes that kind of retrospection in the light of such a shocking experience, and I am glad that GEP has taken the initiative," he said. Scientists from India, France, Germany, Denmark, and Chile since the August 2018 floods had been analysing the development and land usage trends in Kerala. "Once the Remoulding Kerala Sustainable State Model is implemented, Kerala can be positioned as a global leader for sustainable living...I extend all my support to this novel project," the Minister said. GEP Secretary Dr. M.R. Thampan submitted the State Model Proposal to the Minister, to great applause. The function also attended by esteemed dignitaries including Dr. Shashi Tharoor, Member of Parliament and Former Under-Secretary-General of the United Nations; Mr. Kummanam Rajasekharan, the former Governor of Mizoram State; and the Member of Kerala Legislative Assembly, Mr. C. Divakaran. His Holiness Jagadguru Swami Isa gave the Invocation Address, emphasizing the importance for the State Government and the people to put effort into balancing energy, not only in terms of quantity but in quality for long-term sustainability. “Total happiness and total peace will only be achievable through scientifically grounded programs like the GEP’s Sustainable State Model. Qualitative and quantitative energy balance is the need of the hour,” he said. The first step of implementation of the Sustainable State Model is proposed to be planting fruit-bearing trees in the tourist destinations, and along roads and railways. The fruits would be made freely available to tourists and the common people. The first phase, as suggested by the Minister, will commence at Veli and Akkulam Tourist Villages. “This initiative has several benefits, including increasing green cover in the State, reducing the effects of climate change, creating interest in tourists about Kerala’s traditional trees, and developing a culture of protection of common property,” said Dr. B. Vijayakumar, a renowned economist and the former Principal of Kerala Institute of Travel and Tourism Studies. Also recommended in the first steps of the Project would be to increase forest cover along the coastline, gradually shift buildings further away from the coastline, and to consolidate the areas for Government, education, housing, and industries. The Project Coordinator Dr. Marcus Guderle is the Chairman of GEP Germany. He has done site visits and mapped out the first Phase of the project to be implemented at Veli Tourist Village and Akkulam Tourist Village with various species of fruit trees, and developing the Phase II for implementation at a larger scale. Prof. Dr. V. Unnikrishnan Nayar, Hon. Professor of Optoelectronics, University of Kerala and Dr. George Varghese, Former Director of the Kerala Council for Science, Technology and Environment, illustrated the importance of the I-Theory in the present scientific context. Dr. Srikumar Chattopadhyey, Scientist (Ret’d) from National Centre for Earth Science Studies also gave an addresses about the long-term implications of the GEP’s Sustainable State Model. The function concluded with a delighteful Cultural Programme by the students of the Isa Viswa Vidyalayam, a pilot school for Education for Total Consciousnes, which celebrated the conclusion of its 21st year. GEP Founder, His Holiness Jagadguru Swami Isa, spoke about the long-term benefits of balancing quality of energy in the State.